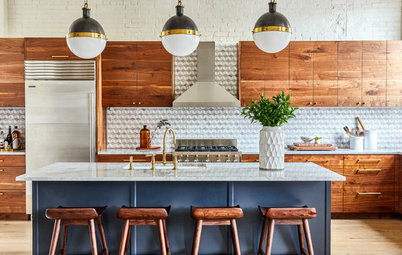 White and gray may be holding steady as the most popular colors for kitchens, but I’m noticing a definite uptick in interest in adding touches of more vibrant hues into the mix. 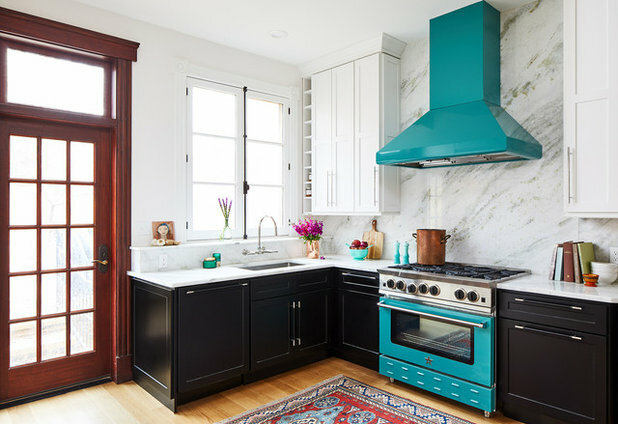 One way homeowners are seeking to introduce color is through appliances in unexpected shades, such as magenta, lime green and coral. 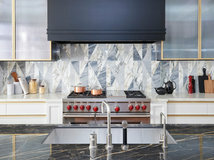 Colorful appliances were on display at the Kitchen & Bath Industry Show in February, where high-end appliance manufacturer Dacor showed off ovens and ranges that can be made in any color a homeowner chooses. Plus, I’ve noticed recently with my own design clients that stainless steel-appliance fatigue has set in. 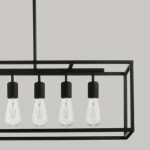 But these same homeowners aren’t necessarily excited to install black or white or other neutral-hued appliances either. I don’t know which came first, the wide variety of colorful appliances available or the demand for them, but they are suddenly everywhere. Of course, colorful appliances have been around a long time, almost as long as appliances have been available for purchase by homeowners. 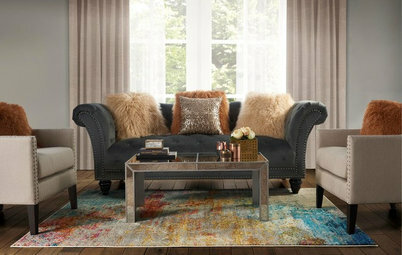 But the vast array of colors now available is unlike before, when a limited palette would move in and then out of fashion. 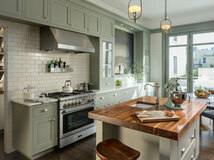 If you’re ready to get on board with colorful kitchen appliances, have a chat with your design professional about just how colorful you want to go, and to coordinate other colors and finishes with your chosen appliance color. 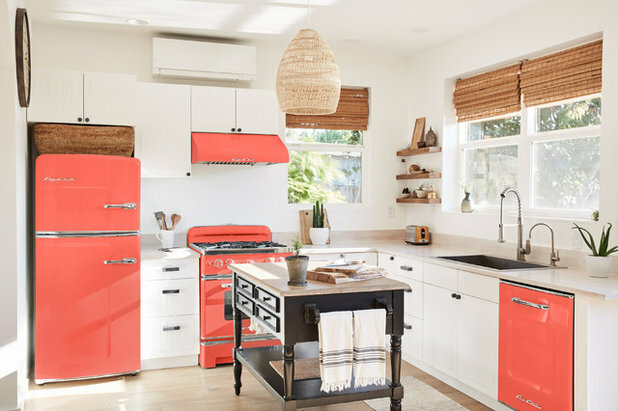 This fun, retro kitchen goes all-in with coral appliances. 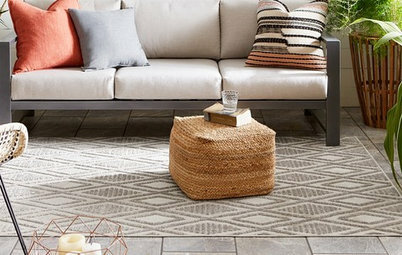 They work so well here because the rest of the color palette is light and neutral and the space gets an abundance of natural light. Are You a Fan of Pantone’s 2019 Color of the Year? 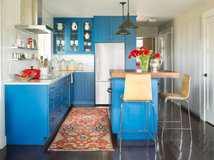 Another strategy is to go for a fun color on one appliance and keep the remaining appliances neutral. 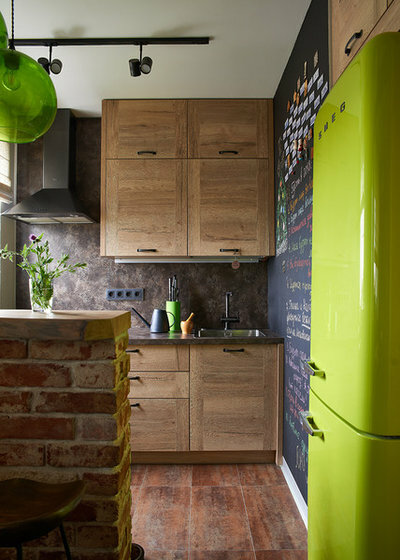 Think about picking up the appliance color elsewhere in the room, such as a softer or darker shade of it on an adjacent wall. 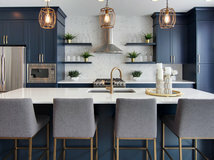 Here, Sogno Design Group expertly used a lighter version of the range color on the wall, which ties the colors of the space together beautifully. 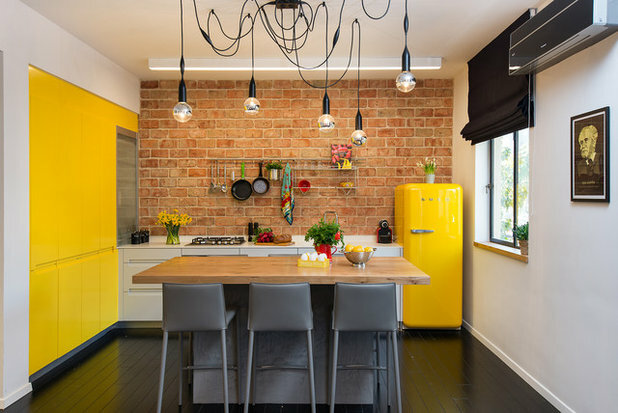 You could also directly match some or all of your cabinets with a colorful appliance. 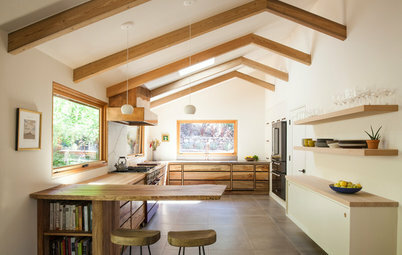 In this kitchen, designed by architect Julia Staroselsky, I like how the vivid yellow refrigerator is visually balanced out by the bank of cabinets on the left. 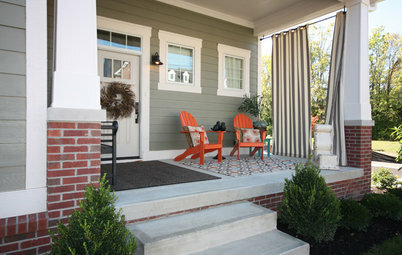 Much more of this vibrant hue could be overwhelming — this is just right. 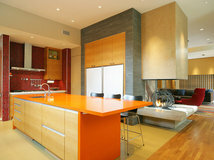 This kitchen also features a range in eye-catching orange, this time paired with a large stainless steel vent hood. 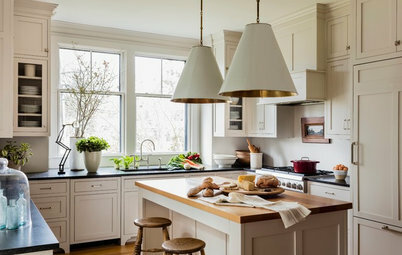 Such a large range clad in stainless could run a bit cold and sterile, especially in an otherwise all-white kitchen. 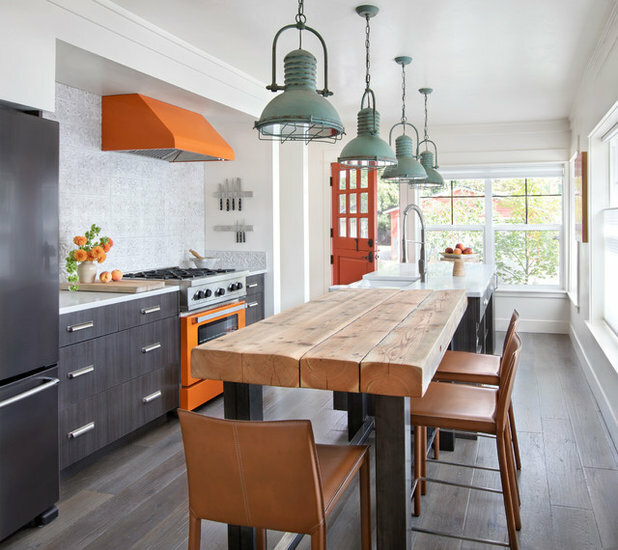 I therefore salute this bold color choice in this kitchen by RS Mannino. 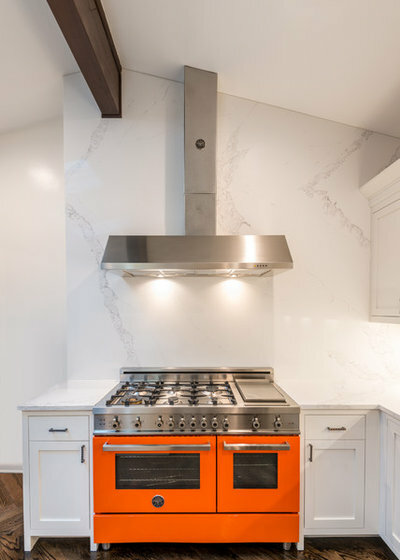 Here’s another mostly white kitchen — this one is by Bakstad Construction — that gets an exciting dash of color via the range. It’s fun, and it brings so much warmth and personality. 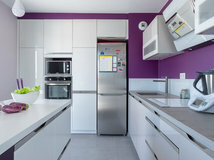 Of course I’d be remiss if I didn’t point out that colorful appliances can fit into any style of kitchen, not just modern or contemporary spaces. They also come in less intense hues, such as pictured here. Now if a range can be described as beautiful, this soft blue one makes the case. 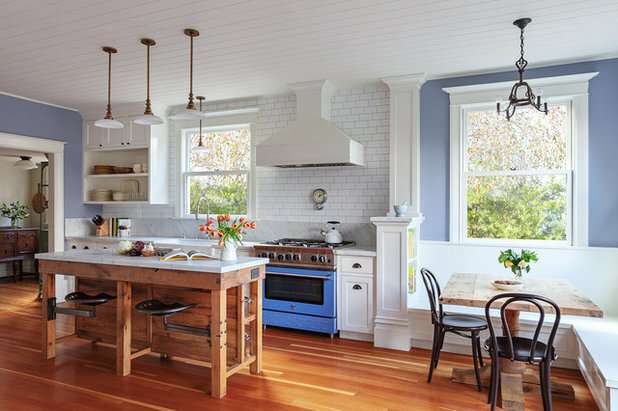 It’s a nice touch of color in this elegant kitchen. 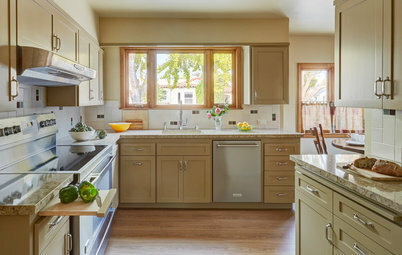 Bottom line: ​I​f you are renovating on an extremely tight budget, these appliances are probably not for you. 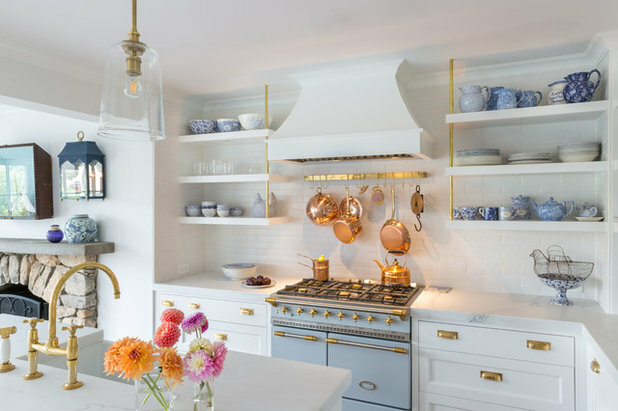 But​ if​ you love the look of these colorful appliances​ and have a little more to spend​, you can offset the splurge by going with more wallet-friendly cabinets and finish materials to make up the difference. 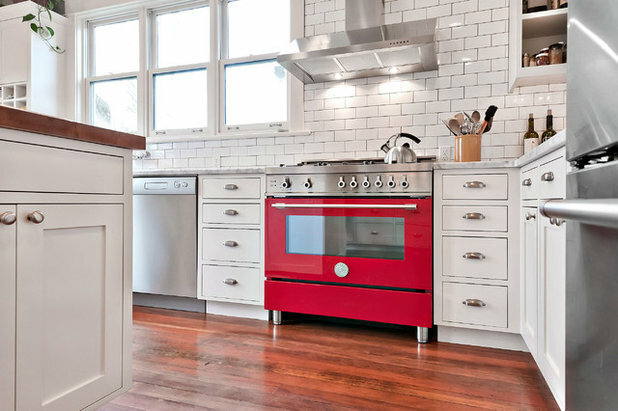 Your turn: Are you a fan of colorful appliances? 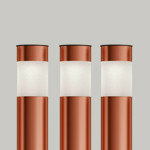 What is or would be your chosen hue? Tell us in the Comments. @maureengarrison2 you should look into the cost of having an auto paint shop painting your appliances a different colour. 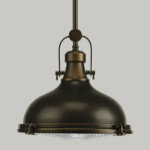 I believe it is cost effective compared to paying for top end appliances. 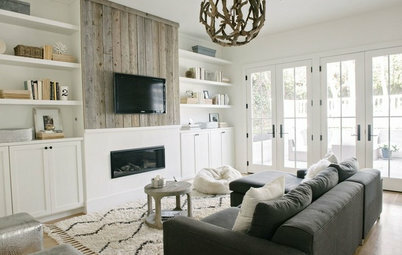 @Suzanne Melton No matter how you decorate your home whoever buys it is going to make changes. 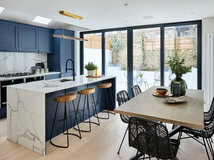 We all live our lives differently and have different requirements of our homes, so even if a buyer absolutely loves your home as is chances are in time they will want/need to make changes. 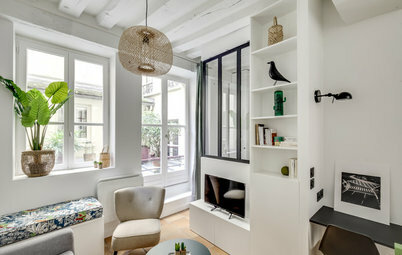 So, live in a space that gives you joy. Unless you are planning to flip a property quickly and make a profit decorate for yourself and don't pander to a mythical future. I have gotten excited about this in the past, but retro, color, and quality/options don't necessarily come all together, especially for the price. 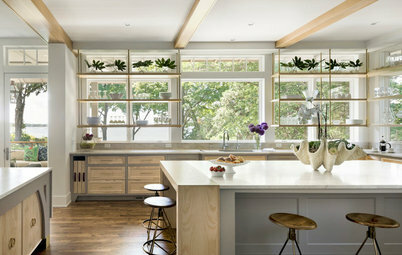 I got sick of S.S. in my last kitchen, moved towards white w/ SS trim. Slightly retro without the crazy price tag. 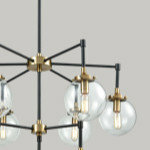 But don't get me wrong, I would LOVE a $25,000+ french range!!! Jolene, LaCornue might be $25K and up, but Lacanche is much less. A Lacanche is still not cheap though. They do have minimal electronics and so should last a lifetime. They are extremely well built.